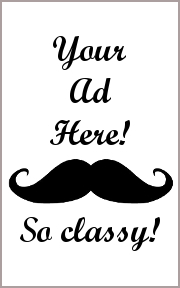 Financial journalist and author B.C. Forbes said “Work is the meat of life, pleasure the dessert.” Dessert is often seen as the “reward” for finishing a meal and used as leverage by parents around the globe to motivate their children to eat their dinner. In this game, you will be tasked to serve desserts to a collection of finicky guests. The trick to satisfying each guest’s sweet tooth is in the cards. 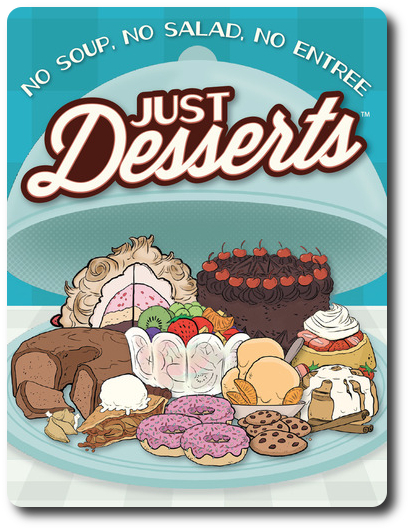 Just Desserts, designed by Andrew Looney and published by Looney Labs, is comprised of 76 Dessert cards and 24 Guest cards. The cards are as durable as your standard playing card. The illustrations by Brooke Allen and Andrew Heath portray the guests and the many tasty desserts with a great deal of color and detail. Expect your mouth to water and your stomach to rumble while playing the game. To set up the game, first separate the cards by type. The Dessert cards have a blue background and the Guest cards have a yellow background. Shuffle each type separately to create 2 decks. Second, deal 3 Dessert cards to each player, face-down. This is the player’s starting hand. Place the remaining deck of Dessert cards face-down to one side of the game playing area. This is the Dessert draw deck for the duration of the game. Leave room for a discard pile. Third, deal 3 Guest cards face-up in a row in the middle of the playing area. This row is referred to as “Unclaimed Guests”. Place the Guest deck face-down next to the row. This is the Guest draw deck for the duration of the game. Leave room for a discard pile. Just Desserts is played in turns with no set number of turns per game. A player’s turn is summarized here. The first thing every player does on their turn is draw 1 Dessert card. 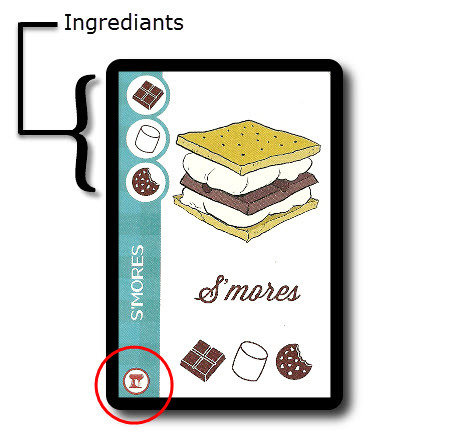 Dessert cards depict a specific dessert and the ingredients it’s made out of. This information is very important for two reasons. First, some guests have a favorite dessert and will ask for it by name. Second, some guests are very particular about what their desserts are made out of and won’t want certain ingredients. 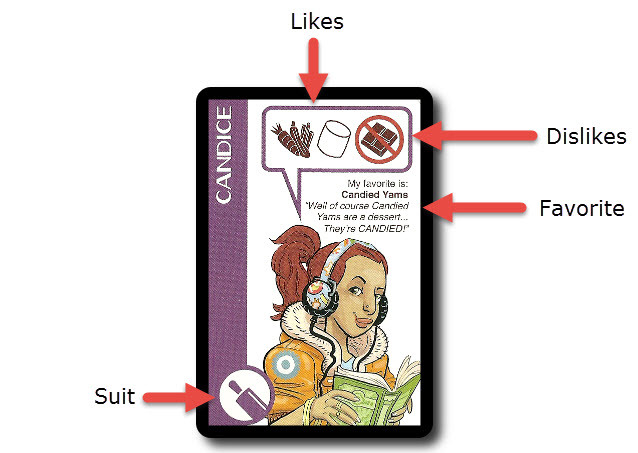 Some Dessert cards also display a small suit symbol on the lower-left corner of the card’s face (shown below in the red circle). This suit symbol is a clue that the dessert depicted on the card is a guest’s favorite. After drawing 1 Dessert card and adding it to their hand, the player then draws the top-most Guest card and adds it to the row of Unclaimed Guests. The player must now take 1 (and only 1) of the following listed options. If at anytime the Guest or Dessert draw decks are depleted, shuffle their discard decks and place them face-down to create a new draw deck. In total, there are 12 different types of ingredients, all of which are represented by a symbol and have a district taste. Everything from chocolate to pudding is covered, mixed, and blended together to form different desserts. If a Guest card doesn’t list a specific ingredient as good or bad, it is ignored on the Dessert card. If the player can satisfy the Guest card’s listed ingredients and restrictions (if any), the used Dessert cards are discarded and the Guest card is placed in front of the player. Any Guest cards in the Unclaimed Guests row are free to take, in addition to the top-most Guest card in the Guest card discard pile. Some of the Guest cards also name a specific dessert by name that matches a Dessert card. This is referred to as the “Guest’s Favorite”. If the player is able satisfy the Guest card using the Guest’s Favorite, they collect the Guest card and draw a bonus Dessert card, which is added to their hand. This is referred to as being given a “Tip”. 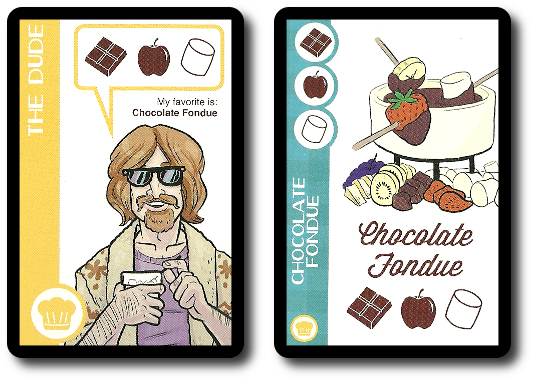 The Dude abides the fondue, man. It goes perfect with his White Russians. This option allows the player to draw 1 Dessert card and add it to their hand. There is no hand size limit in the game. This option allows the player to discard any number of cards in their hand and draw that many Dessert cards back into their hand. If 2 or more Guests cards share the same suit, the player now selects 1 of the matching suit cards to place face-up in the discard pile. This is repeated until no more than 1 of any suit is visible in the Unclaimed Guests row. The player should stop and consider which Guest cards they are placing in the discard pile, since the top-most Guest card in the Guest discard pile is still available to claim. This guest is referred to as “Standing in the Doorway”. This ends the player’s turn. The player looks to see if they have successfully met the conditions to win the game. If not, the next player in turn order sequence now goes starting with step 1 noted above. Several advanced rules are provided that can be used if the players are looking for a more challenging game. Each is summarized here. The advanced rules can be mixed and matched per the players’ preference. The suggested method of introduction is to start with the Poaching & Blocking advanced rule and then introduce the others as requested. This advanced rule allows players to steal (“poach”) an opponent’s satisfied Guest card by playing the correct Dessert cards or playing the Guest’s Favorite. The attempt to steal the Guest card can be blocked by the player by playing any number of Dessert cards that re-satisfied their previously satisfied guest. Unless, of course, the theft was made using the Guest’s Favorite. In which case, the theft cannot be blocked unless the Guest cards lists a second Guest’s Favorite. If the player can play the second Guest’s Favorite, the block is successful. When a Guest card is stolen, the player can attempt to satisfy a second guest and both the opponent and the player draw 1 Dessert card. If the attempted theft was successfully blocked, the player can not attempt to steal again this turn, but they can continue their turn as normal. Dessert cards used for the block are discarded, but the blocked player returns their Dessert cards to their hand. This advanced rule gives the player a fourth option to use during step 2 of their turn. If the player has 4 single ingredient Dessert cards (commonly referred to as “Aces” in the game), the player can discard them to force each opponent to move 1 satisfied Guest card they have in front of them back to the Unclaimed Guests row. The player then draws 3 Dessert cards and can attempt to satisfy 1 Guest card. When a player collects their Guest card using Dessert cards that are not the Guest’s Favorite, an opponent can shout “Surprise” and reveal the Guest’s Favorite Dessert card. This advanced rule is similar to the Poaching & Blocking rule, but it can be used out of turn. To learn more about Just Desserts, visit the game’s web page. The Child Geeks had no problem learning how to play the game and jumped right into it. 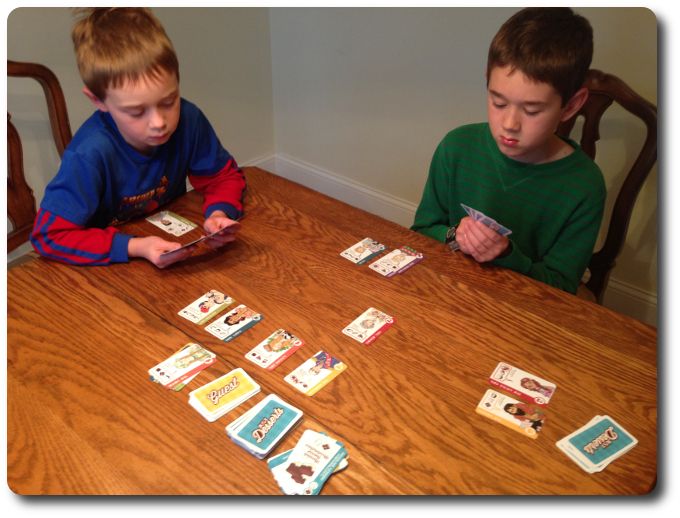 At its core, Just Desserts is a set collecting game, which a game mechanism that the majority of our Child Geeks are familiar with. To be honest, the Child Geeks more or less taught themselves how to play the game with very little adult interaction. The game is just that easy to learn. One Child Geek said, “What I like about this game is all the food! This game makes me hungry!” Another Child Geek said, “This game isn’t that hard, but if you don’t play smart, you are going to lose.” We threw in several of the advanced rules, but the Child Geeks disliked having their Guest cards stolen. They all agreed that the game was good enough without the advanced rules and gave it their collective thumbs-up. The Parent Geeks found Just Desserts to be an easy game to learn and a casual game to play with both their families and with their peers. According to one Parent Geek, “This is just a nice, easy to play, casual game. It’s relaxing and I can visit while I play it. I like that.” Another Parent Geek said, “I would find this game boring if it weren’t for the fact that it plays so fast. If you want to win, you have to be aggressive with those desserts!” Like the Child Geeks, the Parent Geeks didn’t care for the advanced rules, finding them unnecessary. As one Parent Geek put it, “The advanced rules make the game unnecessarily longer without adding any real value. I’ll stick with the normal game.” When all the desserts were served and the dishes cleaned, the Parent Geeks voted to approve Just Desserts for their families and friends. The Gamer Geeks were not impressed with the game. According to one Gamer Geek, “The game is too light for my taste and stays too long at the table. It should be done in 10 or less minutes, but one of our games lasted around 25 minutes, which is insane for a light set collection game.” Another Gamer Geek said, “The game is OK, but not a game for serious gamers. Maybe this could be used as a filler, but I think it lacks enough depth to be of real interest to a seasoned gaming veteran.” And finally, another Gamer Geek said, “The game is solid enough and plays like clockwork, but ultimately fails to bring the fun to the gaming table. I would guess this game would do very well with kids and families, but players looking for a game with depth will be disappointed.” In the end, the Gamer Geeks all agreed that Just Desserts was a well-designed game, but not one for them. They rejected Just Desserts, finding it to be lacking enough meat to sink their teeth into. Just Desserts is a light game. Very casual in its game play and breezy in its execution. This is not a game that will challenge you so much as make you pause for a few moments to briefly consider your options. The most complicated aspect of the game is scanning the table and your hand of cards to quickly make a match. After that, it’s just a matter of being lucky. You can drop cards to get more cards, but its’ always a random draw. 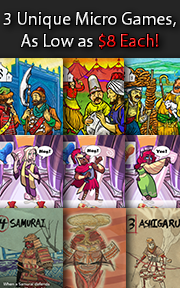 Which might seem limiting, but many of the Dessert cards have 2 or more ingredients, providing the player a higher probability of making a match. I suppose one could easily state that the game wants you to win. The problem is, the game wants everyone to win and there can only be one winner. It can be rather cutthroat at times, but I never felt like I was really competing for the same Guest card as an opponent. This is due to me not knowing what my opponent is up to. I would collect my cards and sit on my hands until it was my turn. At which time, I would collect the Guest cards I could. Rinse and repeat. The advanced rules allow you to interrupt opponents, but the end result is a game with just more options, instead of more depth. Just Desserts didn’t do much for me or the Gamer Geeks. I enjoyed playing it with my kids, but I wouldn’t suggest it to anyone but the Child Geeks, their Parent Geeks, and non-gamers. If Just Desserts sounds like the perfect game to satisfy your gaming sweet tooth, I encourage you to give it a try. As for me, my gaming taste buds need something with more kick.